THIS IS A UNOFFICIAL TRANSLATION OF THE ORIGINAL DUTCH COPY. ALL RIGHTS RESERVED. Villa Besem mediates in the home rental business on behalf of the owners and their representatives. email: see email link in the menu. If you fill out this email form we will contact you as soon as possible. The rent is a certain amount including ancillary costs, as further described in the detailed description in the houses. The rent does not include the additional costs, as stated on the price list of the relevant property. These additional costs must be paid onsite. Payment of the rent is due, the amount payable to the bank account indicated by Villa Besem. Besem to Villa Upon receipt of your reservation we will send you a confirmation and also the invoice. You must postmark 25% of the rent to meet. Within two weeks of the date Upon receipt of the deposit the booking is final. The remaining amount you pay at least 6 weeks prior to arrival. If you book less than 6 weeks in advance, it should be. The entire rent paid within 1 week If on the day of arrival the full amount is not received by us must be paid. The outstanding amount at the reception desk If during your stay or later emerges that the amount is credited to our account yet, you will be reimbursed to you immediately. Any change in your designated reservation to the extent that the change is possible, charged by our change fee (see price list). This fee will not be charged if you wish to book. You can choose from a one week stay (or several weeks), a midweek or weekend. A week's stay runs from Friday afternoon to Friday morning, a midweek stay runs from Monday afternoon to Friday morning and weekend runs from Friday afternoon to Monday morning. Unless otherwise indicated on the price list. Unless otherwise indicated, the house at your disposal from 15:00 on the day of arrival until 10:00 on the day of departure. On arrival please check in between 15:00 and 17:00. If you wish to check in later are kindly requested to contact with us. On arrival, you must meet. A deposit of € 200.00 If the house after the rental period is completed without damage and all tenant obligations, on the expiry of the rental period, the deposit will be refunded. Possibly caused additional costs, such as damage caused by the tenant and / or missing or extra cleaning, be deducted from the deposit. Claim for damages by Villa Besem higher than the deposit paid is offset by the payment and is additionally claimed by Villa Besem. The tenant may no other, respectively. a larger number of persons or animals into the new house then or in the lease. The booking agreement is described. Villa Besem may reject such persons or animals in that case. If you cancel the reservation or prematurely, you are the percentages of the rent for the agreed rental period listed below verschuldigt if canceled up to 3 months to date is 20% of the rent due, if canceled up to 2 months before commencement date, 50% of the rent is due; cancellation up to 1 month before starting date, 75% of the rent due, if canceled within 1 month before arrival, 90% of the agreed rent is due; cancellation on and after the effective date, 100% of the agreed rent due. 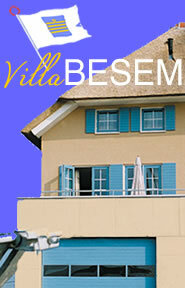 Villa Besem is entitled to the agreement as dissolved if: at the start of the rental period the total rental price is not met, the deposit is not due upon arrival will leave the rented prematurely left the leased involve the effective date of the rental period for 17.00, without notice to have done it hired later will be involved during the rental period;. the reported number of overnight guests exceeded and this permission is obtained from the reception, the deposit is not received in time, if the tenant duty of care in relation to the house rented by him seriously failed, especially when damage is caused willfully or otherwise the duties of orderly rent waived. Despite good care of Villa Besem may be that you have a complaint about any of the holiday or facilities as a guest. Please take in this case as soon as possible contact our reception staff, so we have the opportunity a few things to fix. If, however, can not be resolved to the satisfaction your complaint, please respond only in writing no later than 2 weeks after departure from the park to Villa Besem BV, PO Box 10, 8715 ZH Stavoren. All disputes, flowing from or related to the establishment and implementation of the agreements to which the conditions apply, may be submitted to the Dispute Recreation, Suriname Street 24, both by the guest who is not professional or commercial acts, as by Villa Besem 2585 ​​GJ The Hague. A dispute will only be dealt with if the guest has submitted the dispute. Within two months after the birth of his complaint to Villa Besem Within three months after the complaint was submitted to Villa Besem, the dispute should be brought. Written to the Disputes Committee Wendt the Guest does not dispute the Commission but to the ordinary courts, he must do so within a year of his first letter to Villa Besem. All agreed outcomes are the Recron-Terms holidays from 1 January 1998. Those requirements may be obtained from: Villa Besem, Molenweg 16 C 1182 CL Amstelveen. All previous price lists and conditions are canceled. Any price changes and manifest errors excepted.